Kapakai, Stunning Coastline Views of Poipu Beach, sleeps 6-8 guests, Free Fitness Club Membership. * Share with your friends this amazing view of Poipu Beach! * Base rate is for 6 people, maximum 8. Please view "RATE NOTES"
Kapakai - Hawaiian for "coastline" - you will understand this home's given name when you take in the stunning view of the Poipu coastline from the upper deck. This hale (house) is located on top of a volcano (extinct, of course) in a quiet local neighborhood. Grab a towel & walk down the hill to Poipu Beach Park and Brennecke Beach. Excite your tast buds with dragon heart fruit, rambutan, lychee, star fruit and more. The galley kitchen with its practical and handsome finishes is a great platform for your culinary adventure. Many decorative plates, bowls and glassware provide for delightful table settings. Step into the Spirit of Old Hawaii surrounded by colorful local artwork and distinctive island furnishings. The living areas unfold with a comfortable breezy living room ... to the dining space with a massive round table ... to an intimate conversation seating area opening onto the expansive L-shaped covered lanai ... then one more adjacent family room space with ocean glimpses revealed through verdant foliage. Breathe in the fragrant plumeria and bright bougainvillea bordering the grassy yard which encircles this home. Plenty of room for youngsters to run & play - croquet, anyone? The master suite on the ocean side has a queen bed, TV/DVD viewing. The master bath shower, floors and vanity are tiled in decorative travertine stone tiles. The guest bedroom wing of the home features a king poster bed in one room and twin beds in the other, TVs in both. These rooms share a "Jack and Jill" bath with fun fish & cobalt blue tiles at the shower and vanity. As the sun sets, the western view is a delight to enjoy the last rays from a memorable day in the comfortable lounge chair seating, or at the nearby table over pupus (hors d'oevres) and beverages. Poipu Beach Park, just minutes away with 2 free parking lots, offers a large grassy area dotted with swaying coco palms. There are picnic tables, showers, restrooms, even a convenience store, restaurant and beach rentals across the street.There is a cove called "Baby Beach" where toddlers play in the sand and splash in the shallow waters. A few steps away in the clear warm water, colorful tropical fish swim beneath as you snorkel just feet from the shore. The calm waters and gentle waves are enjoyed by swimmers of all capabilities. Experienced surfers can catch large-breaking waves further out beyond the reef. Brennecke Beach, at the east end of the park, is renowned for body surfing and boogie boarding. FREE FITNESS CLUB AMENITIES INCLUDE: cardio workout room, weight lifting equipment, exercise room (and classes), poolside table and chaise lounges, restaurant and bar and pool/hot spa with waterslide! Lots of games to play for young and old alike - 4 tennis courts, 3 pickleball courts, basketball, badminton, volley ball, shuffleboard, ping pong, and more lawn games (all equipment provided!!). Juliana Cherry is a licensed real estate broker in the state of Hawaii, Lic# RB 20080. Ala Muku Vacation Rentals is a dba of Momi O Mo'o Inc., Lic# RB 20905. 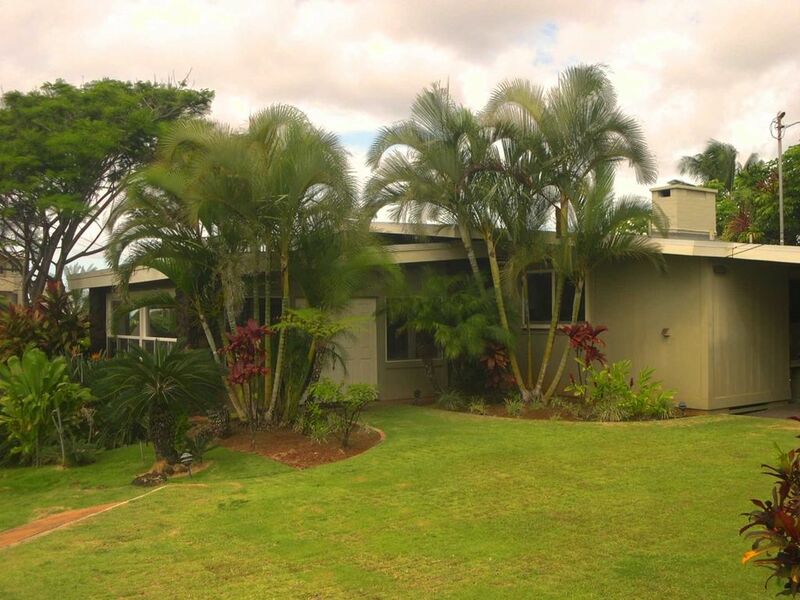 Juliana and Jim own 2 homes in Kauai and manage a number of other beautiful homes and condos. They began visiting the Garden Island in 1997 and now are permanent residents. Juliana is a licensed real estate broker in Hawaii. Her special enjoyment is gardening. She loves to share the many wonderful features of Kauai with her visitors, especially the great beauty of the local botanical gardens. Jim is a builder of many years and now enjoys semi-retirement while keeping his hands busy with the occasional remodel. We provide for our guests free membership in the local fitness club. It includes weight room, cardio room, exercise room, plus pool and side, and bar and grill. There is a hot tub at the house as well as at the fitness club. Not sure the pictures can really do justice to this property. The location is fantastic making it easy to walk down to the beach for our teenage kids and for morning walks. Easy walk over to the Hyatt for great hikes along the coastline. Great outdoor space with wraparound porch and amazing views from the rooftop deck. Our family’s favorite VRBO house yet with plenty of space for a family of six to spread out and be comfortable. Awesome home!!! Everything we could have hoped for and more!!! Greg and Julie B.Lodi, Ca. Home has everything you need and is located in a great area. Easy walk to the beach- we had a great family vacation!! Jim and Juliana were wonderful hosts. Beautiful home. Lots of space for our 2 adults and 4 teenage children. Loved the wrap around covered deck with views of the ocean. Lived there for morning coffees and sunsets. Enjoyed hot tub and upper deck in evenings. Well equipped. Everything you could possibly want for kitchen and beach gear. Loved the location. Easy walk to Poipu Beach and Shipwreck Beach. Exceeded expectations. Already thinking about when we can come back! Perfect house for a family in Kauai! This house was perfect for my family of 6 in Kauai. Our favorite part of the house was the rooftop deck with beautiful ocean views! We also loved being in walking distance of Poipu Beach and saw many seals and turtles sunning themselves on shore! Hot tubbing in Hawaii with an ocean view was pretty spectacular! The Cherry’s were wonderful owners to work with and I would definitely recommend this house! Nice house and location was great! Property was well kept and worked out great for 6 adults and a one year old. Lots of beach gear available to use, and croquet which we did play! Rooftop is nice for spotting whales and star gazing at night. Only minor glitch was two of the bedrooms share a bathroom, was a little inconvenient at times. Would definitely stay at this property again when returning to Kauai. Our family of 6 (2 parents, MIL, and 3 boys stayed here for Christmas vacation. It was a great location for enjoying the South side of the island. We would highly recommend this comfortable home. Poipu beach as well as some of the other best beaches on the island are just walking distance. Great restaurants and shopping are a short drive away.